This condominium is privately owned and you are renting directly from the homeowner who's company name is Nihilani Properties LLC (as will appear on your credit card statement). Therefore reservations are not transferable between units. A $500 security deposit is required with this reservation and we may process a credit card authorization in that amount prior to your arrival. A charge may result for damage to the condo, missing contents or for exceeding the stated number of overnight guests. If a guest arrives without notice earlier than the scheduled check in time of 3pm or fails to depart by the required 10am checkout time, their security deposit which is on hold will be charged in full. Our units hold very busy time lines and the failure to leave on time can cost money and schedule disasters. Likewise arriving earlier than scheduled can disrupt the busy cleaning flow, cause mishaps and confusions with the housekeeping staff. Damage in excess of the $250.00 security deposit will additionally be charged to your credit card commensurate with such damage. Guests are responsible for reporting any damages immediately to the on-island contact Graeme D. Merrin, RB, ABR, GRI, 808 822 0272 or graeme@graememerrin.com. Kristen was super easy to work with. It made the trip that much better. First class service. I needed a late check-out and she made that work without a hitch. The home was beautiful, clean, and well furnished. It had all the amenities you'd want. The bed in the master bedroom was incredibly comfortable. Better than my bed at home. The garage was stocked full of beach toys, chairs, umbrellas, boogie boards, and even a skimboard. Honestly couldn't ask for more. Even the neighbor was awesome. Some of you might be stoked to find out who it is. Location was great. Nice and quiet, the supermarket is close, Hanalei was right down the road. Will definitely stay here again without hesitation. Nothing that I didn't like about the house. The only inconvenience was the garage remote having to be pressed about a dozen times before it actually opened or closed. Highly recommend this place if you are looking for a relaxing vacation with nothing to ever have to worry about. Our stay at Nihilani was very pleasant. We really liked it because it was every clean. I highly recommend your place to my friends. We loved the property, it was beautiful inside and out. It had a great pool that my children enjoyed. The wifi was unreliable but we didn't come to sit inside and surf the internet. The condo was beautifully finished, well stocked with beach toys for all ages. Will definitely be coming back! thank you so much for your review. We are pleased to hear you enjoyed your stay in condo 3a at Nihilani. We are sorry to hear you did not have a good connection. We do wish you would have called so we could have helped. Sometimes it just needs to be reset. We do hope you can come again soon! Our family [5: including 3 young adults] decided to escape the snow and plan a destination Hawaiian Christmas vacation. We found the Nihilani townhome site and booked the 3a property after viewing the online photos and reviews. This quiet community was just what we ordered. The pool and bbq area is well maintained including a jacuzzi. 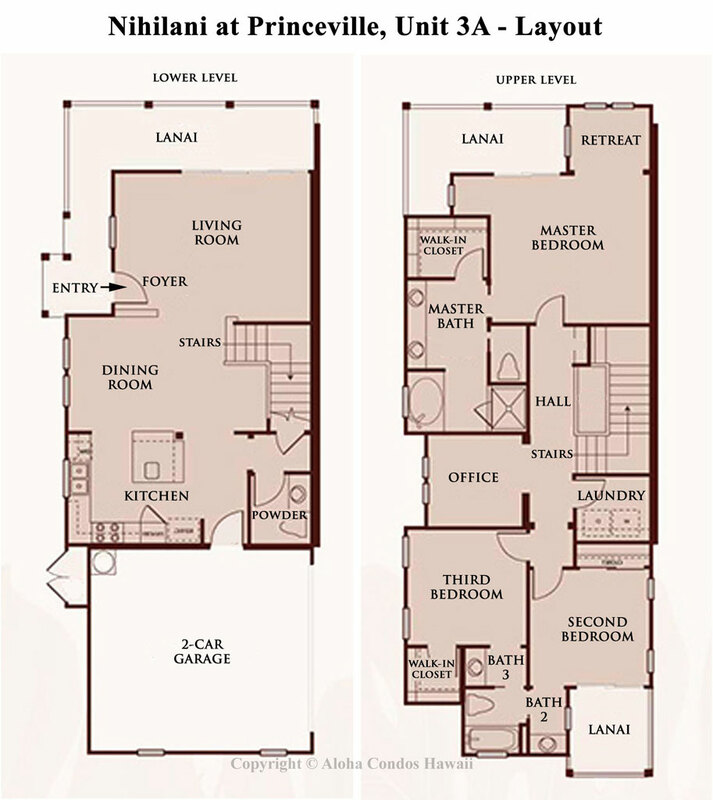 The townhome is spacious, clean and with ample amenities provided. The garage was stocked with beach chairs, sand toys, etc. which was much appreciated. The pictures provided are exactly as depicted, no surprises. This property is located at the end of a cul de sac and very quiet. Bath and beach towels are provided with a washer and dryer also available. Kitchen was fully equipped with pots, pans, cooking utensils, silverware, dish towels, spices, dish soap and dishwasher liquid. To name a few. Huge plus the grocery store is minutes away which was very handy. The only downfall our family could come up with was better instructions on getting into the townhome. We unfortunately arrived late at night in the dark and rain. Signage was good but as we pulled into park at the garage we found no way to get in. You actually have to walk around the townhome [three townhomes are attached] to get to the front door. The keyless entry code instructions provided worked very well, especially since we arrived so late at night and a light was left on at entry for us to see. Maybe putting the front door access location into the email providing the code would be helpful for others. But surely not a deal breaker. Again we would highly recommend this property. The townhome was nicely appointed and super clean. The development is quiet and well kept. We enjoyed our stay in Princeville and would come back again. Beautiful and comfortable condo. Great linens, full size washer and dryer, and nicely stocked kitchen. We informed the property manager that we were staying with two small children and they set up the unit with a portable crib, highchair, and basket of small toys prior to our arrival. The complex is close to great walking trails and an easy walk to a great playground, shops, and restaurants. Beach access is a little more difficult, parking for the nearest beaches is very limited. The downside is that the complex itself has extremely strict guidelines that we were not aware of at booking (also, this unit has a very strict cancelation policy) and permanent residents behind this unit were clearly upset to have children in the complex. Our 2 year olds were unable to enjoy anytime outside the unit without being yelled at. I would highly recommend this unit for families without children, but would choose a more “kid-friendly” complex for families traveling with young children. The garage does easily fit two full-size cars, so don’t let the parking guidelines deter you (we were concerned after reading the parking rules sent with our reservation confirmation, but had no problems). Our stay was very comfortable. The only thing that would have been nice would have been a bedroom on the main floor. I had a stroke a year ago and getting upstairs was a little difficult. I managed though! We (all 8 of us) were very comfortable. Thank you. Thank you for taking the time to post a review upon our request. We are happy to hear that a party of 8 was comfortable in your stay at Nihilani 3a. If at anytime you have questions such as where the bedrooms are located within the unit, we are happy to answer before booking so we can find a sutiable unit for you. We are here to answer questions and help you make the best choice in accommodattions. Spent weeks looking for a decent place to stay while on Kauai. Found that most places won't book for 3 day stays but this one was available and I'm glad we got it. The house itself is beautiful inside and most accommodating. The garage was full of toys for the kids and anything you could need for the beach. The beds were perfect and there was plenty of room for everyone. There were lots of rules to follow, but if you are a civilized human being, then it really isn't that big of a deal. Also one of the oy houses I could find with a/c, coming from Arizona it was a must for us. Best place I have ever stayed in on Kauai. Been there 10 times on the island but this was the best. Over the top. Off the chain!! Everything a family could need as far as beach items for the whole family. Double garage was great and led right into the town home for easy access after shopping. Will not stay anywhere else after our experience. This is the place! We vacationed in Townhome 3a for a week with 3 children (12, 15 and 16) and had a wonderful time! The condo was spacious for the 5 of us and very easy to navigate in/out. The garage was wonderfully stocked with beach chairs, snorkel gear, and much more - definitely a bonus of the rental. The pool/hot tub were a short walk and never busy. We would definitely stay at Nihilani again, and Townhome 3a was perfect for our family. The good:roomy condo in desirable location. Location within the complex is ideal, very quiet and private. Nice modern amenities. Lovely poster bed in the master. Hardwood floors provide a nice open feeling. Could use improvement: Washer/ dryer could use replacing, kept crashing at the spin cycle. Beds very comfy, however the topper in the master is bit too soft for our liking. Microwave is a bit difficult to decipher for basic use. Futon coach in family room is not the most comfortable. In general the chairs in around the dining table were really soft and not the very comfy. We thoroughly enjoyed our stay and would stay at this place again! Kia ora. We had a great time in Kaua'i. The house was our perfect base camp. Well set up. Great space for 5 adults. And all of the useful beach gear was great!! Thanks for a fab stay. Townhome 3a was the perfect place for my girlfriend getaway! The condo was beautiful, comfortable, and immaculately clean! We loved having a completely stocked kitchen, full-sized laundry room, and tasteful decor to help us feel at home. We had a wonderful time staying in this condo! We are so glad to hear from you and that you found the townhome to be perfect. We do want our guests to feel at home and are glad you enjoyed. Please come again soon! We recently stayed at nihilani 3a .We came to kauai for our wedding renewal with a group of 34. Who all stayed in different units at nihilani and although all the units where nice the best and my favorite is nihilani 3a .It is in a great location at the complex ...floor plan and decor are perfect.I will definitely be rebooking 3a for my future stay on the island. We got there and were very impressed how clean the condo was with new upgrades, like new. The managers along with the property were great. I told the manager I would not mention in the review the grumpy old lady nearby but after the conversation but we had another issue with her at the pool. Unfortunately this woman should not live near anyone especially at a condo community. We waivered at sharing our review because then the secret will be out. What a great location! As a family we decided to visit Kauai. We found the rental on line and booked right away because of the great price and close location to golfing, a market, coffee shop, restaurants and a park. If you are looking for a bit of serenity and a small town feel this is the location. The condo was well appointed with everything you could need or want. The garage is full of beach chairs, beach mats and kids toys which were used daily. It felt like a home away home. The reviews regarding the couch needing replaced are valid as it is quite uncomfortable. The dining table also looks well used but we were okay with that having 2 grandkids along with us. The condo has been "lived in" which gives it the homey feel. We loved it! So much so we tried to book for 2018 but it wasn't available for all of our dates. Any questions or issues we had during our stay were promptly replied to. It was the best customer service that we have had in the 20 years we have been travelling. Mahalo! Thank you for the great review as we do appreciate it. We are happy that the condo served your needs and made you feel at home. This certainly is our goal for the guests. Thank you for your feedback with the furniture and it will be noted with the owner. We hope we can accommodate you again in the future. We also appreciate the great comments about the customer service and we are glad we are there to help. Condo was very nice. A few very minor problems, but a real nice place. This was a family vacation of 11, so we rented two condos (3a and 24c) since both were right next to each other, though in different buildings. We were very satisfied with this condo. We, however, did encounter some problems with the tenant across the yard in 24b who was not happy with any noises at all, so we had to tiptoe around a bit when playing outside. He was a real jerk. Thank you for the great rating for unit 3a at Nihilani. We are sorry to hear that the neighbor caused you some problems with noise levels. We did have the on site management speak with him and give him a warning so hopefully that will not be a problem from this point. We have had a few guest since your departure and we have not had any complaints. We hope you can come again. I stayed at this beautiful condo with my son, daughter-in-law, and granddaughters for 3 nights. It was beautifully decorated and the beds were so comfortable. There were beach chairs, boogie boards, snorkel gear, beach umbrellas, and everything we could possibly need to enjoy all that Kauai had to offer. Items in the kitchen were labeled, allowing us to use them correctly and return them to their proper places. The AC worked perfectly and once the house was cooled off, it stayed cool. I would love to stay again! Thanks for the great rating for the unit 3a at Nihilani. We are happy to know you enjoyed and found everything to your liking and you would love to stay agiain. We hope to see you! The condo was nice with a good amount of space. The pool and hot tub were both really nice to have within the complex. The dryer took a really, really long time to dry -- would take 2 hours to dry a load of beach towels so that became annoying. Also, be aware that if you are bringing children this might not be the best place. One of our kids was sitting on the patio before 8 am playing with a balloon and someone else yelled at them. Later we got a highlighted rule about "noise" before 8 am. She wasn't being that loud but that made us uncomfortable and especially with kids waking up early for the time change it made it rather unpleasant. In the future, I probably wouldn't book this again for a family due to that unpleasant experience alone. I can understand needing to be mindful of noise and neighbors. But seriously she was sitting on the patio with a balloon. It wasn't that big a deal. Also, the extra fees really add up. I feel like they nickel and dime you. Extra fees, extra fees per person above a certain amount, a $300 cleaning fee, etc... It starts to add up. Also the kitchen was not well stocked at all. We barely had enough forks. There were no plastic utensils. There was a lot of boogie boards and beach gear so that was nice. The couch in the living room is really uncomfortable. Didn't make it a great place to lounge. Thank you for posting a review for the townhome 3a at Nihilani. We are glad you found the unit to be nice and spacious. We will look into the dryer but sometimes if they are the new energy efficient units they do take longer. We apologize for a neighbor that was complaining to you. There are of course quiet hours but they are not designed for regular noise levels but related more towards parties and exceptional noise levels. We will have the property manager in the complex speak to the neighbors. The fees are all disclosed before you even book the unit and are all very typical for whereever you might go with vacation rentals. You must have seen the wrong numbers as the cleaning fee is 234.36 in your account plus tax as this is a large unit. We will have the housekeeper staff look at the flatware to see about purchasing some to restock. Mahalo again for the feedback. Two Families stay was great! We were there with another family in the same unit (4 adults, 4 children) for a week in February, and had a wonderful experience. The home was clean, spacious, and everything worked great. We would stay there again! The only very minor detail that would be nice for the next guest would be to supply instructions for microwave. It seemed to be an older unit, and it took us quite a bit of trial and error to figure out how to use it. There were no instructions. But other than that one very small issue,,,which wasn't an issue really at all, but just more of a comment, we had a fantastic stay. We enjoyed our stay. The condo had plenty of space. It was very clean when we arrived. Nice that it had beach toys available to use. Liked that there were fans in all the rooms and Lanais. Nice complex. Only a few things that need to be replaced. The lampshades in the Living room and twin room. Maybe the vacuum as it had very little suction.Would consider renting here again. The townhouse was very clean and nice; however, there are a couple of issues that I would like to call to your attention. There were several light bulbs out, there should be some instructions on how to operate the microwave, it was very unusual, and I felt that the couch in the living room was uncomfortable and provided awkward seating. Having said this I want to say that everything else was wonderful and very nicely appointed, the beds were super comfortable, the beach towels were nice and thick, the grounds and pool area were lovely and we had a wonderful vacation. Thank you! We appreciate any feedback we can get on our condos in hope to make them the best they can be. We are so happy to hear you did enjoy your stay and had a wonderful vacation. It is always our goal to make our guests want to come back. Our housekeepers do check of bulbs that have gone out and replace them as they see it. If you would have called us we could have come and replaced those for you. With furnishing, it is always a very personal taste that is considered in comfort and design. Usually the sectional seating does provide a comfortable flow though. Thank you again for taking the time to post! Thank you so much for your great review. It is a wonderful townhome and very spacious and is close to lots of great activities. Thank you for your comments on the cleanliness of the unit as it is very important to us to make sure there are no concerns. We do hope that you can come again and spend another great vacation here. Thank you for your business! We stayed there with another couple so the lay out of the condo and the two king size beds were great! I truly feel though the condo needs some serious updates. The guest bathroom upstairs has mold on the wooden blinds and the smell alone was horrible! Felt like I should hold my breath while showering. And I know the closet in the master has drawers for clothing there are no drawers of any kind in either of the two remaining bedrooms and that is pretty inconvenient. The kitchen was nice but the couch needs removed and something less stained and saggy put in in the living area. I've stayed at many rentals so I do realize rentals get lots of wear and tear but this is now excessively worn! We have stayed at 24c in nihilani and it was slightly better but I think I thought the furniture was getting close to an update also. Another problem I had was I questioned amount of hair dryers in condo prior to arriving and was told two. Nope just one, didn't end up being an issue but I think maybe the condo should be looked at, and the scattered stains on the walls throughout the condo was also odd! I also saw a cockroach in kitchen but only one so I didn't call. I realize it's Hawaii! But with the above said I love princeville area, and have plans on returning soon. Just hoping a few updates can happen as Nihilani is also a wonderful area! I just wonder how bad it has to get before updates are made? If the updates were made this would be a ten on a scale of 1-5! Great complex and excellent condo. I do not think there is a better deal in Princeville. Management is great. Don't forget to visit the secret beach and the hide away beach in the vicinity. We will definitely come back again. Mahalo! There were two families sharing this town home for about 2 weeks - we had a great time! Plenty of space for everyone and were appreciative of the amenities included for our use. Overall the home was clean and well cared for; just a couple of minor items which needed fixing (bed/bath door locks, 2 upstairs windows, en suite bathroom sink and shower not draining well, dining chairs ) but these didn't impede on our stay.Pool was a hit with the kids; hot tub was great too. Would have been nicer to have the BBQ closer to the place (the 2 communal ones are in the pool area). Would highly recommend staying here - and look forward to re-booking for our future trip back to paradise! Fourth Stay and Awesome as Ever! This was our fourth time staying at Nilina 3A and it was as awesome as ever. We just love it and always feel so comfortable, like a home away from home. The condo has everything you could think of and more...beach towels, beach chairs, scuba equipment, highchairs for the babies, a pack and play, toys and books, and movies...too much to mention. I also realized it has an amenity that I have been taking for granted-air conditioning. The rest of our family stayed in another condo nearby us and they had to pay an extra daily fee to use the air conditioning. At condo 3A it is included. I just can't say enough good things about this place. It is truly a Hawaiian home away from home. We had a short 2-night stay at the condo. We flew over from Maui for a couple of days to hike the Kalalau Trail. The condo was perfect. It is large and was very clean and well equipped. We considered it a bargain at the price. Amazing Luxury, Perfect Location, Clean and Comfortable, Spacious! We were extremely impressed with this townhome. First, the interior is first class, well designed, tastefully decorated, clean, and very spacious. The kitchen is well stocked with everything you need. Beds and rooms are all comfortable, and very clean. The location is very convenient, only 5 minutes away to Hanalei Bay and some of the most breathtaking beaches just another 15-20 minutes north/west (Tunnels, Ke'e). Just a few minutes to the Princeville stores and some very good restaurants, as well as the St Regis. St Regis also has a nice public beach, and apparently you may use their free valet parking when accessing this beach. Easy to rent kayaks and surfboards in Hanalei. The common pool area is nice, with a couple BBQ's for use. Limited views in this townhome complex, but it's nice enough and you probably won't be indoors that much anyways. Maybe about an hour drive to Poipu and the West Beaches, but worth the road trip! We can't wait to rent this property again. Comfortable home in a beautiful setting. We enjoyed our stay in this very comfortable home. Nearly everything we needed was supplied including some beach toys, towells, chairs, etc. We especially enjoyed sitting on the lanai in the morning, watching the trees blow in the breeze and listening to the birds. The condo was close to great beaches and the shopping was convenient. We had the most AMAZING time!!!!! The condo is so nice and well equipped. As soon as we entered the condo, it was beautiful all around. The pool is also beautiful! Everything u need is close by as well. Will definitely be coming back and recommend to family and friends!!! This condo was well appointed and had all the comforts of home. Close to tunnels and Ke'e beaches. The beach accessories-chairs, boogie boards, snorkel equipment, and cooler all came in handy. The condo community was very peaceful and quiet. Reservations were easy to make and the staff are very helpful with any questions we had. If we every find ourselves coming back to Kauai, this will be our first choice of places to stay. This was a beautiful and spacious condo, great amenities! Beautiful townhouse with plenty of space for our family of 4, and absolutely every amenity you could possibly need to make your stay comfortable. Beach toys in the garage and a basket of toys in the house gave my young girls (ages 2 1/2 and 4) many hours of entertainment. Would definitely stay here again on a return trip. The complex is extremely quiet and relatively empty. The pool was beautiful, but a touch on the chilly side. Aloha Condos provided great customer service. They were available any time during the week if we needed them. Phone numbers and condo information were located in easy to find and obvious locations. The location of the condo was perfect for us. Close to grocery, Hanalei and even Hanakapiai Beach. The condo itself was modern, clean and very comfortable. The owner has taken pride in his condo and it shows. I highly recommend this condo and hope to use it again as soon as we can. The pool and BBQ area are very nice and provide a great place to relax close to the condo. If you have trouble negotiating stairs this is probably not the place for you. All 3 bedrooms are upstairs. The photos on the web are a little older and don't reflect some of the landscape that has matured over a few years. Nihilani condos are clean spacious and quiet! If you like golf, close market, nice pathways to job, drink at the St. Regis, pool tanning and a good hot jacuzzi at the end of the day this is the place. Me and my family spent 4 great days in this property and stunned us every single day of it. The details, the conditions, the luxury and the flawless attention by the administrator are worth every single cent. Great cooking!! Townhome 3a was wonderful. Large rooms, beautifully decorated.We really enjoyed staying there. It is close to everywhere we wantedto go. Nice having a garage, too. Very clean and neat. Everythingwe needed was there.Would def. stay there again and also recommend to friends. This year the family and I decided to visit the island of Kauai. I found this rental online. I was impressed with all of the positive reviews. The price was right and it was in a desirable area (Princeville). The complex is very close to Hanalei, which offers a great variety of restaurants and shops. The grocery store is also very close. Upon opening the front door of our unit we were very pleased. The unit was clean and well kept. Plenty of space for the kids. It felt like we were home. There were Hawaiian goodies on the kitchen island left for us (nice touch).The unit has everything a family needs to feel at home. Fully equipped kitchen, washer and dryer, comfortable furniture, cable tv, and air conditioning. The garage even has beach chairs, beach mats and kids toys. Only a few minor things to consider. The bbq is out at the pool. We grilled a few times and had to bring our food back to the unit. The pool closes at 9pm and the HOa is strict about getting everyone out on time. Overall we had an excellent stay and hope to return very soon. I would highly recommend the Nihilani, unit 3a. I have to say the unit was very nice on the inside but the rest of the complex was terrible. Parking is horrible, location of the unit was bad as we heard traffic noise until 2am every morning. The pool was suppose to be heated but it wasn't. The pool was so cold we actually had to use a pool in a different complex. We had the management jump down our throats regarding a car being parked in Vistor parking in front of the unit. He was so rude to my niece that nobody needs to be treated this way especially a vistor to the island. Overall Unit a+ Complex and Management F. After reading reviews from other people that have stayed in this complex they also have had siimilar run ins with your onside management. I seem to think this complex is mainly residents not majority rentals. I wouldn't stay in this complex again just due to the way we were treated. Dear Guest, I am delighted you liked the unit and gave it an A+. I am also very sorry you had a difficult time with the onsite management. About 30% of the units at Nihilani are occupied by year-round residents, and we have appealed to the management company to be more lenient with the rules as the majority of people there are on vacation. I agree the parking is difficult at Nihilani, but each unit does come with a 2 car garage, so for the majority of guests parking is never an issue. The pool at Nihilani is not heated, and I’m not sure where that might have been advertized online. I hope you will reconsider and stay with us again. Nihilani is one of the few new developments with central a/c and has a beautiful pool and BBQ area complete with restrooms and shaded areas. It is a great place for couples and families alike. We loved the condo it was equipped with everything you could need from snorkel gear,towels,boogie boards,etc. It was the highlight of the trip. The decor was amazing and all the finest upgrades.My husband and I found privacy on our own terrace. Even though their was ac we never used it. We had a wonderful view. Pool was great barbecued there nightly. It was such a nice and comfortable condo my family didn't want to go out. Loved our stay!!! Absolutely Incredible!! We can't wait for our next trip back!! It was a wonderful condo in a wonderful area, we loved our stay.We traveled with family which included an 18 month old so we were very pleased to find childrens toys, a stroller, and a pack and play (Crib). Our only suggestion would be to purchase/bring a baby gate for the stairs. This was our second stay at Nihilani at Princeville and it is just so easy to feel at home there. It takes no time to get settled, and we defintely didn't want to leave. It is by far the most well appointed vacation rental we've ever stayed in. This year we invited some friends to come out and they brought their 20 month old- the condo was perfect for him. The pack'n play, highchair, even baby utensils were put to good use. Everything we needed was readily available. We also appreciate how clean it is. You can truly unplug and relax. We had a great stay at this condo. The place itself was large enough to accomodate 6 of us. Kristen at aloha Condos was great... very responsive and really cared about us a and making sure we had a great stay. Great location, enjoyed beach chairs and toys. Easy driving distance to beach to soak up the sun. Kitchen well stocked with dishes. Enjoyed the town house with our adult children. Great place. Our family and friends had a wonderful time. The Condos were beautiful and the kids loved the pool and BBQ. We can't wait to come back! Most of the times pictures are a lot nicer than the actual thing when it comes to staying at a hotel or vacation rental, but this town-home exceeded our expectations. For 6 adults there was more than enough room to relax independently or gather in a common area. The entire home was very tastefully decorated and the beds were all very comfortable. The home comes complete with everything you could possibly think of to make your stay one to remember. Boogie boards, snorkel gear, beach chairs, and so much more. The residence it self is in a very nice area, and in our opinion one it looked the nicest from the outside. Kristen was wonderful to work with by e-mail and equally as helpful when we called to ask about a trip we wanted to make. The only thing is that Princeville its self is at the north of the island so we spent a lot of time going one direction because we wanted to see things all over the island and you cant go very far to the west before the road ends. Otherwise i'm pretty sure we had the best deal in all of Princeville! Nihilani 3a was a great townhome for our family. The 2 story layout was fantastic! The third bedroom with twin beds was great for our teens. The kitchen was beautiful and well stocked. I appreciated the full size washer and dryer. We thought everything and everyone we worked with in the rental was wonderful. These items truly not bother us, but if you are looking for a few minor improvements...sheets on master bed were a bit large and slid some, sofa could stand to be cleaned, and slightly larger wastebaskets in the bathrooms would be helpful. It was wonderful with an excellent location to many activities on the island. Thank you! Beautiful condo with all of the amenities of home! We really enjoyed our stay and were given prompt attention when needed and had questions. We would highly recommend staying at Nihilani Princeville 3A for an enjoyable home away from home. The townhouse is large, clean, very nicely decorated, comfortable and well-stocked. The beds are comfortable, and the AC works well. Kristen at alohacondos pretty much thinks of everything you could need. Speaking of Kristen, the manager, she was very easy to work with, easy to get a hold of, and very accomodating. The townhouse community is in a good location. Close to all the beautiful north shore sights and beaches, without being TOO far north. It IS a bit of a drive to get down to the south shore and kapaa/lihue etc, but you get used to the driving. The grounds of the community are very pretty. The pool was a great spot to hang out when we couldn't swim in the river run-off water after huge rains ("brownwater"). The only small negative of this rental that I can think of is that a couple of the rooms are a little dark (family/living room and master bedroom). I think it's because the bulbs are low-watt florescents, and I can understand the desire to conserve energy and keep electricity costs down. Other than that, the place is perfect and I would definitely stay here again! Very nice townhome and the price was right.Princeville is beautiful,would go back there in a second. Kristen was super easy to work with. It made the trip that much better. First class service. I needed a late check-out and she made that work without a hitch. The home was beautiful, clean, and well furnished. It had all the amenities you'd want. The bed in the master bedroom was incredibly comfortable. Better than my bed at home. The garage was stocked full of beach toys, chairs, umbrellas, boogie boards, and even a skimboard. Honestly couldn't ask for more. Even the neighbor was awesome. Some of you might be stoked to find out who it is. Location was great. Nice and quiet, the supermarket is close, Hanalei was right down the road. Will definitely stay here again without hesitation. Nothing that I didn't like about the house. The only inconvenience was the garage remote having to be pressed about a dozen times before it actually opened or closed. Highly recommend this place if you are looking for a relaxing vacation with nothing to ever have to worry about. My husband and I spent a glorious vacation week in this very beautiful townhome. It is beautifully decorated and very well equipped. We had everything we needed and more. It is very well maintained and very clean. It's a great place to take a walk. When the St. Regis opens in the fall 2009, it will be fun to walk there for a drink or meal. We loved the town of Hanalei...enjoyed many restaurants, a farmer's market and a Slack Key guitar concert at the community center. We loved the one lane bridges and the relaxed atmosphere of the north shore. This was a beautiful Condo and had so much room. We stayed there with our daughter, son-in-law, granddaughter, grandson and son. Our grandson was a year old and they accomodated us with a bed for him. The kitchen was great and just begged to be cooked in. The grounds were fantastic. We enjoyed the pool area and enjoyed meeting the individuals who lived there year around and worked on the Island. We will go back to this location if we are able to make it to Kauai. Our stay with Aloha Condos at Nihilani 3a were the pinnacle of our 1 week stay in Kauai. We walked in to a welcome basket, and had at available to us high end utensils, modern and clean accomodations, plush towels and beach towels, an awesome master bath with jacuzzi tub and separate shower, toys, games, baby gear, beach gear -- even laundry soap! everything was thought of. It was like staying in a high end hotel, vs. a For Rent by Owner property. For a fraction of the cost we had 6 adults and one child stay comfortably! We enjoyed watching the rooster and his family of hens every morning, and making dinner for ourselves in the evening. The location is in a great location in Princeville, just a short drive from the Princeville shopping area, beautiful beaches and hiking trails, and, in the opposite direction, the Lighthouse. The condos are quiet, walkable, and I believe the newest development as of 2008 in Princeville. There is a small, private pool a short walk from the unit; my only wish is that the grill was not away from the property. We'll definitely be back again!